Day 1: Travel to the Valley of 1000 Hills to enjoy the magnificent panorama. Short drive through the colonial town of Pietermaritzburg famous for its many Victorian buildings. View sites of the spectacular Howick Falls where the Umgeni river plunges 95 metres over dolomite cliffs. Lunch stop at a local country inn. 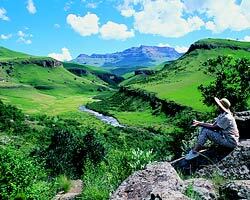 Travel through the Natal Midlands to the central Drakensberg. Dinner and overnight at a local resort. Day 2: Morning at leisure to enjoy the full spectrum of sporting and recreational activities: horse riding, walking, swimming, golf, etc...After lunch, return to Durban.